[Episcopal News Service – Jerusalem] The cold early-morning rain that fell here on Good Friday seemed to blur the lines between Christian denominations and make clearer the united Christian witness in the Holy Land, as pilgrims huddled together in the wind to retrace Jesus’ road to Calvary along the Via Dolorosa. 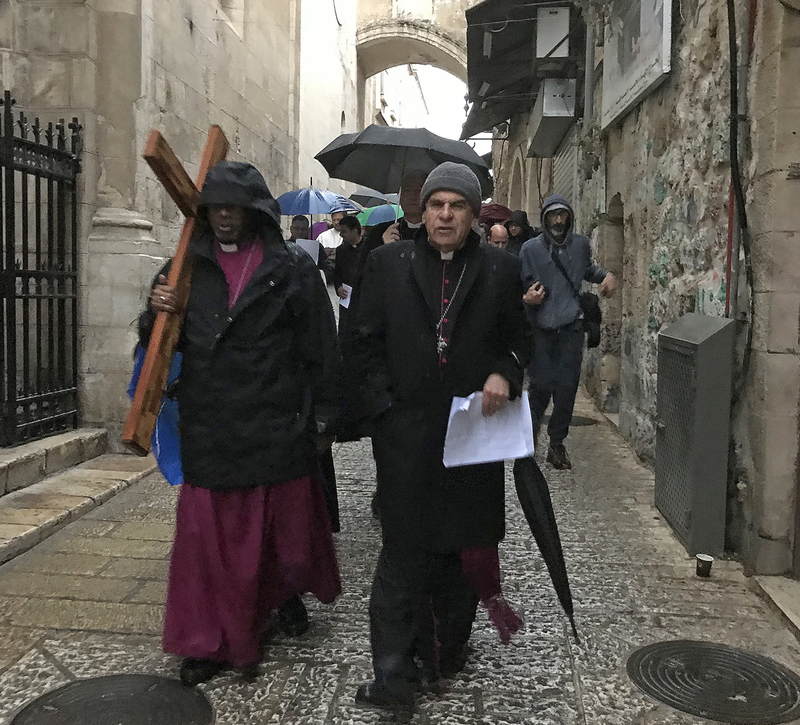 Among them were Presiding Bishop Michael Curry and those traveling with him on a Holy Week pilgrimage. With the skies alternating between threatening and bright, the pilgrims walked gingerly along the rain-slicked limestone pavement that has been worn smooth by centuries of Christian devotion. Cassock hems sometimes dipped into the many puddles along the way, making for a cold and wet experience as the rainwater soaked in. 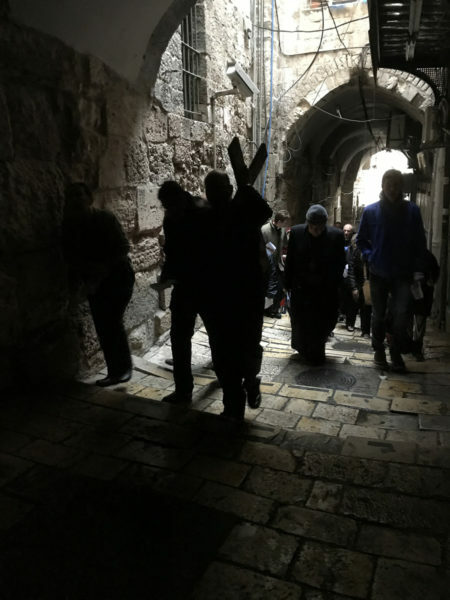 Every year, the Good Friday ritual is re-enacted in the midst of everyday life in the Old City in Jerusalem. Shopkeepers were slowly opening their sweet shops, bakeries and souvenir stores. Religious icons and jewelry and vestments were for sale next to butcher shops and hair salons. Feral cats scrounged for food. Trash collectors carefully drove their motorized carts down the narrow pilgrim-lined streets. A police officer joined the procession as a guide. 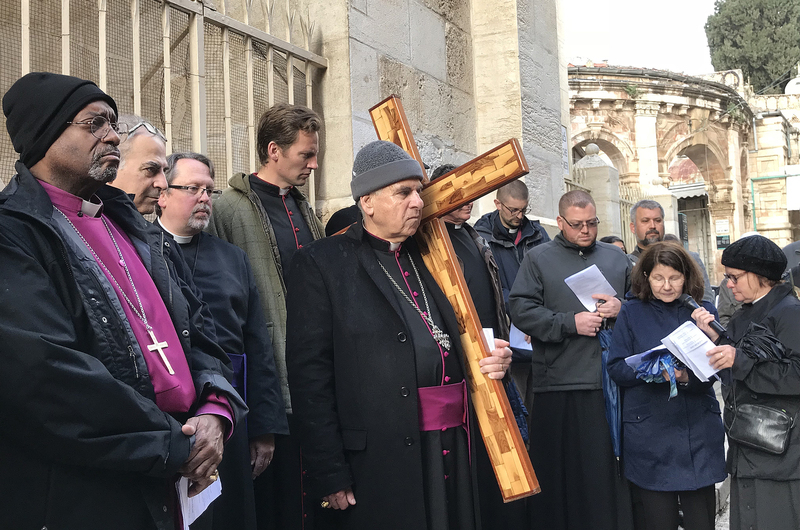 Members of the Episcopal Diocese of Jerusalem and the Evangelical Lutheran Church in Jordan and the Holy Land join each year to walk the way of the cross. At each stop, a pilgrim read from the Bible and others led prayers for themselves and others. The pilgrims sang hymns as they walked between each station. Curry and the Most Rev. Suheil Dawani, the Anglican archbishop in Jerusalem, were among those carrying the cross during the walk. For those who know what it is to lose their faith. Whenever we are called to account for our faith. 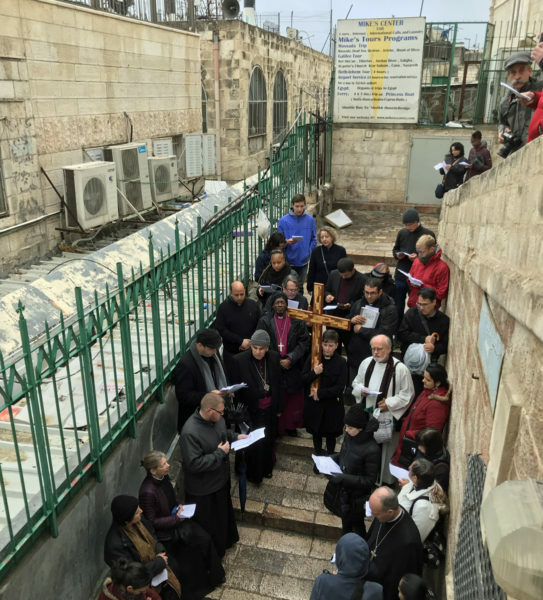 The Anglican and Lutheran pilgrims, along with representatives of other Christian faiths, then ate a simple breakfast at the Lutheran Church of the Redeemer near the end of the Via Dolorosa. Azar later preached in Arabic during the traditional Good Friday liturgy at the Anglican Cathedral Church of St. George the Martyr. The cathedral has many Arabic-speaking members and parts of the service were also conducted in Arabic. 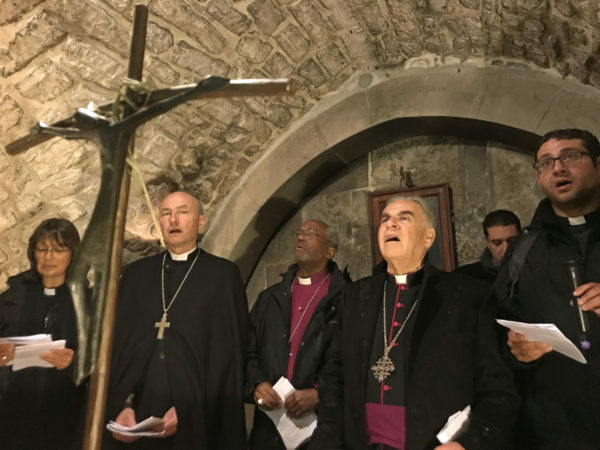 Also on Good Friday, His Beatitude Theophilos III, patriarch of the Holy City of Jerusalem and All Palestine, welcomed Dawani, whom he called “our brother,” Curry and the group traveling with him to his offices in the Church of the Holy Sepulchre. The patriarch said with a smile that he has a tradition of offering “spirituality” to his visitors. An assistant then offered small glasses of brandy to the guests. Dawani invited Curry to make this Holy Week pilgrimage. Complete ENS coverage can be found here. The presiding bishop was accompanied by the Rev. Charles Robertson, canon to the presiding bishop for ministry beyond the Episcopal Church; the Rev. Margaret Rose, Episcopal Church deputy for ecumenical and interfaith relations; the Rev. Robert Edmunds, Episcopal Church Middle East partnership officer; and Sharon Jones, Curry’s executive coordinator. 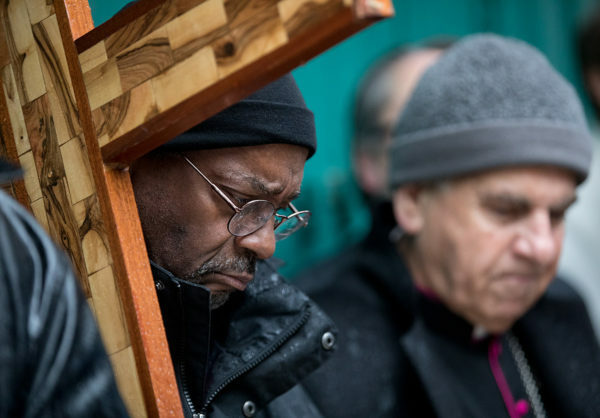 Thanks be to God that the shared communion of Episcopalians and Lutherans walked together in the way of the Cross to let the world know we are ever seeking hand-in-hand to be the living presence of our Lord and Christ in these terribly violent and broken times. With all respect and love, I beg you, in the name of the God we crucified, say something. The Orthodox Patriarch presented the Presiding Bishop with a Pectoral Encolpion, not a Pectoral Cross. Well, Pectoral icon is better than Pectoral Cross. Thanks for changing it. But it is still an Encolpion! 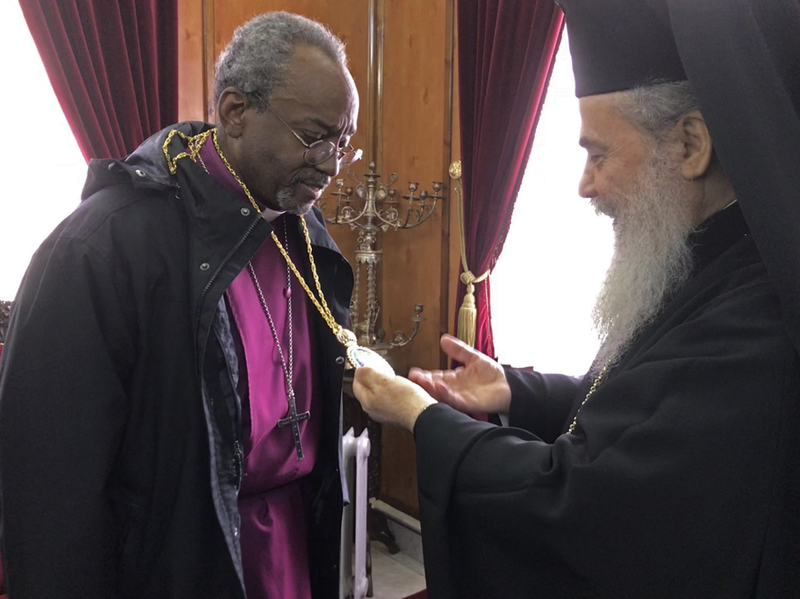 Thank you so much, Presiding Bishop Michael Curry, for making the connections with these clergy in Jerusalem on Holy Week. 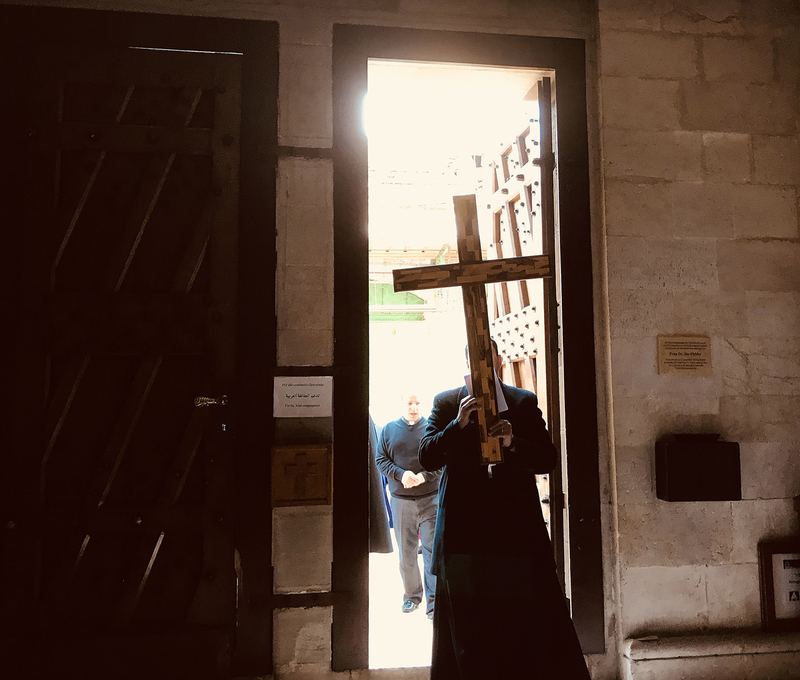 I feel so much more a part of Christianity there because of the wonderful photos which showed us real life and the House of Veronica. 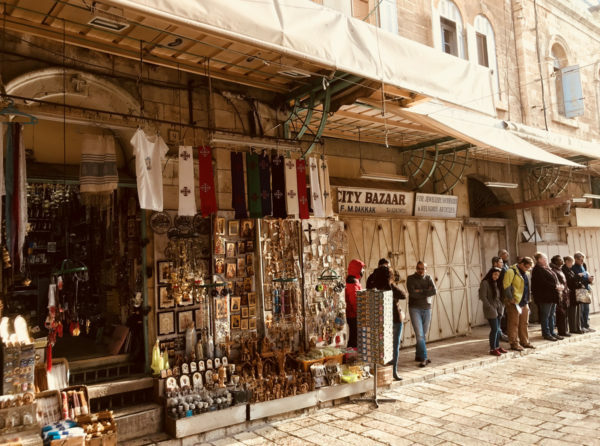 Never knew her story although I have prayed the Way of the Cross and remembered the “lady with the cloth to wipe Jesus’ face.” May the Lord continue to bless the efforts of all involved and bring healing to Jerusalem.